Can be used as general overview or review of the water cycle. Educators may wish to provide students a question sheet to keep student interest or ensure the video is watched all the way through. Although this video does not directly articulate that water is a short-lived greenhouse gas, this is an excellent description of how one of the greenhouse gases (water vapor) impacts climate. Very basic overview of how the sun drives the water cycle and the interdependence between the water cycle and the climate system. Emphasis on water in the atmosphere and how ocean currents transfer heat from the topics to higher latitudes. Features interviews with several NASA scientists who study water and climate dynamics. Comment from expert scientist: This video is accurate and explains the water cycle effectively and clearly. It traces the cycle in a linear fashion and marshals data, figures, and expert interviews to support its claims. 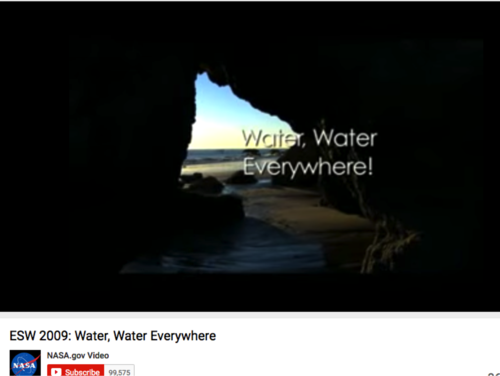 One can use this video to review or introduce water-related activities, focusing on evaporation and water in the atmosphere. The video uses a variety of images, diagrams, and data products to drive home how the water cycle and climate are impacted by changes in one or both processes. Well-produced and easy-to-use introductory video.